We’re quickly approaching the halfway point of Monk‘s final season and it’s enjoyable to see them serve up a classic who-dun-it, even if I didn’t find it difficult to pick out the killer. It was a fun ride to the end of the episode, with another strong performance from Traylor Howard as Natalie and an amusing guest turn from Meat Loaf, credited as Meat Loaf Aday. Meat Loaf is super-duper world famous, in fact if you Google “meat loaf” he comes up before the food, and he needs no introduction. Granted, he’s more renowned as a musical icon then he is as an actor, but that’s how his show biz career started and early on he appeared memorably as Eddie in The Rocky Horror Picture Show. He’s the second actor from the film to guest star on Monk. Tim Curry guest starred as Dale the Whale in season two. Mr. Aday (given name Marvin, so no big surprise he chose a stage name) also guest starred on House last season and seems to be equally adept at drama and comedy. He certainly brought a nice light touch of humor to this episode as Reverend Hadley Jorgenson. Also in “Mr. 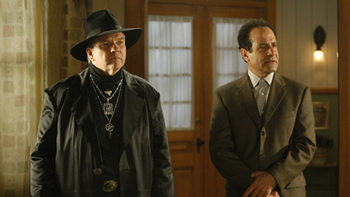 Monk and the Voodoo Curse” are three guest actors who have made previous Monk appearances. Michael Patrick McGill who plays Sgt. Steiner in this episode was also in “Mr. Monk Goes to the Bank” as an unnamed cop. Nice promotion. Sean Blodgett who appears as the coroner played the role of a CSI tech in “Mr. Monk and the Man Who Shot Santa”. David Grieco was also in that episode as Thorn, a member of the bad Santa’s gang. He plays the male paramedic in this one. In this episode we’re allowed to see a very different side of Natalie. It’s apparent that, like Monk, Natalie hasn’t completely moved on from the death of her spouse. I think that’s a big part of what drew her to Monk and what keeps her by his side, despite her really lousy job benefits. For once Monk has to be “the level headed, brave one,” so it’s a different light for him too. Luckily, he pretty much rises to the occasion. The role reversal makes for a fresh and exciting episode. 70-year-old Martha Murphy (Anne Bellamy) power walks by the ball field where a little league team is practicing. Little Petey Cunningham (David Gore) is at bat. She’s greeted by his coach (John Lacy) who jokingly asks her to join the team. “You trying to kill me, Chauncey?” she asks. That’s it. She’s a goner. Bye bye, Martha. You can’t say stuff like that in a Monk episode. Talk about bad luck. Obviously Petey doesn’t have the best luck either, although for a moment it seems as if he does: it’s the traditional inspirational baseball moment, complete with slow motion and soaring dramatic music. You have to feel good for the little guy as he connects with the ball and sends it sailing out of the park. That is, of course, until his teammate finds the home run ball beside poor Martha, now dead with a baseball size dent in her cranium. A few days later Martha’s family looks through her belonging and find a package. Inside is a voodoo doll with a baseball stuck to its head. The package was postmarked three days before she died. Monk seems to consider the problem, but instead he’s concentrating on a trash can which is still out of place. He moves it to the correct location. Later they go to the ball park to look at the “crime” scene and Monk questions Coach Chauncey and the team. “Did you know Mrs. Murphy?” he asks little Petey. Monk is astonished that Natalie believes in voodoo. The rest of the gang tries to convince her that there’s a logical explanation, but they can’t come up with a good one on the spot, so Natalie clings to her belief. Disher gets a call. Another voodoo doll has been reported. Early the next morning, as Monk is vacuuming his apartment, Natalie arrives. Without so much as a surprise alert warning, she announces that she has a surprise. They’re going on vacation and it’s her treat. He’s tempted when he learns they’ll be staying on the 10th floor and he’ll be in room 1010 of a five star resort, but he’s reluctant to leave during an investigation. Natalie quickly offers to call Stottlemeyer to get his okay. She pretends to make the call, but Monk knows that he unplugged the phone to vacuum behind it. She breaks down. “I hate this case,” she tells him. She confesses that the Captain called an hour before. They’ve found a third victim and a third voodoo doll. Stottlemeyer interrupts them. Natalie just called from the driveway. She wants to go home. He tells Monk to go take care of her. Monk’s not at all sure how to do that. Later Stottlemeyer and Disher go to the voodoo shop where all the dolls came from and question the owner Reverend Hadley Jorgenson (Meat Loaf). His business is booming with all the publicity from the deaths, but he denies any involvement. Too late. Natalie is completely freaked out. She points into the kitchen, where Monk finds another box with a voodoo doll. This one has Natalie’s name on it and its little blonde head has been chopped off. Her name is misspelled (T-e-a-g-e-r) on the voodoo doll package and Monk wonders who would spell her name like that. “The Devil,” Natalie says terrified. She explains that the day before Mitch was shot down she had been told by a voodoo priestess that he was in danger and the she should warn him. Based on that, she now believes in all things voodoo and she blames herself for not warning Mitch. Cut to a hilarious dark, foggy Exorcist shot of Reverend Jorgenson on his way to see Natalie. Natalie writhes in pain as they wait for the ambulance to arrive. The male paramedic (David Grieco) asks what she drank and Jorgenson rattles off the list of anti-hex ingredients. Monk recognizes the female paramedic. It’s Angeline. “Small world,” she tells him and she says there’s no room for him to ride in the ambulance with Natalie. He agrees to ride with Jorgenson in his van. As they speed after the ambulance, Monk remembers seeing Angeline’s picture in the newspaper with the second voodoo doll recipient, She was one of the paramedics carting the body away. Jorgenson says he knows her and he thinks she’s a good person. He then admits Angeline bought voodoo dolls in his store. Monk figures it out and he tells Jorgenson that “she’s the guy”. He explains that Angeline wanted to kill her rich uncle and she used the voodoo dolls to divert suspicion. She mailed packages to herself, found some appropriate dead people and planted the voodoo dolls in the packages with new labels. She poisoned her uncle and left a voodoo doll on his counter as well. Despite his awareness of the irony, when Natalie points out that he missed touching one of the meters (which he didn’t: she was just screwing with him) he’s compelled to go back and touch it again. Undaunted he continues his lecture. There is no new Monk on October 2nd. The next episode, “Mr. Monk Goes to Group Therapy” will air on October 9th.